It looks like the meaning of "versatility" has changed since 1963. It has been a long time since the days on the Iroquois River duck-hunting with my Dad and grandfather, to be sure. 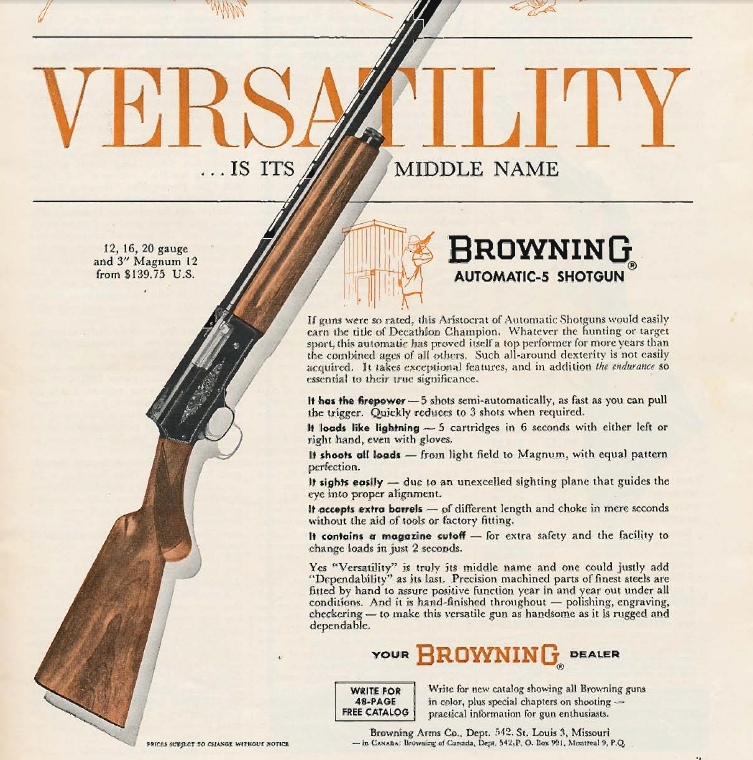 Back then, if you had a Browning Auto-Five and a pocket full of 1-1/4 oz. shells with #5 lead shot, you were living pretty large. Years later, down in Argentina, it was good to get back to #5 lead shot, an A-5, with a B-80 thrown in for good measure. Although my Great-Grandfather's favorite gun was a plump old Ithaca Side by Side, as he told me time and again, it was a Remington Model 11 (made under license from Browning) that got most of the work done. For some high-volume snow goose hunting in Canada, Dad was forced to forego his A-5 in favor of a Browning Gold that never did fit him particularly well, and I was still shooting a B-80 and a Beretta 390. 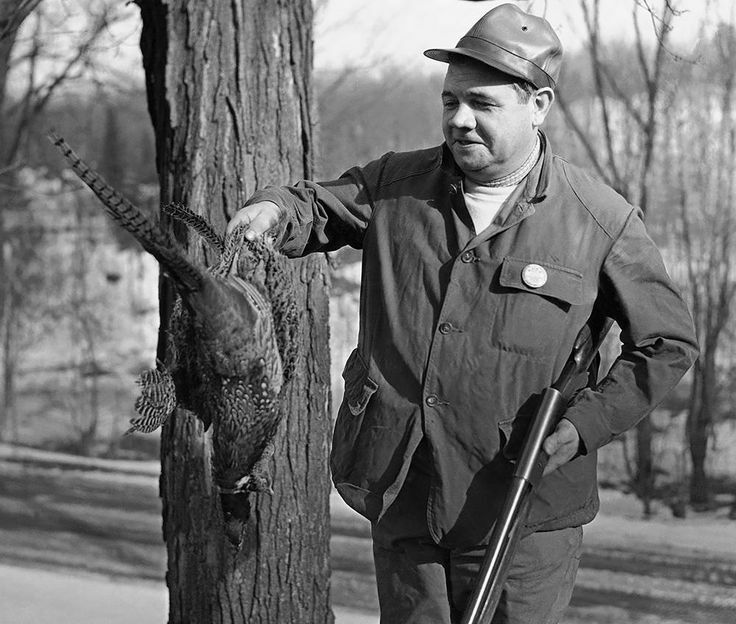 For out-of -the-country hunts, I've subscribed to the Bruce Buck school of gas-operated autoloaders: they are like sheep and when they are alone, they just don't like it. Somehow, over all these years, the observation that wood looks more natural in the woods than plastic failed to sustain permanent traction. Steel is more or less a fact of life, unless you are willing to spend a bit more for Bismuth loads or better. Higher recoil, higher velocity steel #2 loads still fail miserably compared to lead #5 shot, there is no doubt about it. The extra muzzle velocity helps, of course, but only marginally. My version of a waterfowl gun is not greatly divergent from a great pheasant gun. At one time, they were the one and the same instrument. You might want sling studs, water-transfer printing followed by clear coat (a.k.a. camo) that does mean a bit less external care, but you still want a reliable shotgun that fits you that is easy to shoulder and swing. Sure, all 12 gauges shoot the same shells, more or less, but gas autoloaders are more fun to shoot. I personally have a vibrant disdain for 3-1/2 inch chambered guns, something that is not universally held, particularly with the guy that only shoots a 3-1/2 inch chambered gun only because the 4 inch chambered guns aren't out yet. Performance-minded hunters won't like the cost, but Kent Tungsten-Matrix #3 shot 3 inch shells make steel 3-1/2 loads look spectacularly miserable by comparison. Unfortunately, when a new shotgun is developed, the receiver size is decided upon on the basis of unfolded shell length before the first gun is made. A 3-1/2 inch gun, or one with a 3-1/2 inch receiver is invariably excessively long, weak due to the lengthened ejection port and excessively long shell elevator, and out of balance as well, as the breechblock is at the front of the receiver. The gun itself gets even more front-heavy when loaded with 3-1/2 inch shells, as the steel payload is at the front of the shell and those loaded shells are in front of the receiver. Inertia guns, with excessively long receivers in the first place, just get worse when they are 3-1/2 inch receivers. To add further insult, 3-1/2 inch guns often do not handle 1 oz. target loads well, and you pay a premium for the 3-1/2 inch chamber and 3-1/2 inch shells. Low-density steel is still low-density steel, so you gain essentially nothing in terms of range, unless you consider a few feet somehow meaningful. Short shells in long chambers means excessive free-bore and that means inconsistent results when shooting 2-3/4 and 3 inch unfolded length hulls in overly long chambers. To cap it all off, some 3-1/2 inch chambered autos are one-shot wonders when used with 3-1/2 inch shells. Most folks that buy 3-1/2 inch chambered guns don't bother to use 3-1/2 inch shells at all. When you do, for the first time, and you have instantly have stove-pipes and failures to feed (Beretta A400) it can be, and has been, miserably frustrating. Contingent on your personal price range and personal preferences, there are lots of current production shotguns that are quite competent duck-downers. A wide berth must necessarily be given for personal preference, for most Americans agree universally on very few things, and shotguns are hardly immune from personal preferences or proclivities, as the case may be. The most popular shotguns in the United States aren't autoloaders at all, they are still pumps. Prices do vary, for a Super Vinci camo goes for about $1700 as does the Super Black Eagle II, a Maxus camo about $1500, the new A5 $1300, various A400s at $1400 - $1500, the new Fabarm XLR5 Waterfowler at about $1500, and so it goes. The Beretta A400 Xtreme Camo retails for a mind-numbing $1900, street price of $1650 or so. On the economy side, the Weatherby Element (inertia) and the Weatherby SA-08 (gas), both at something like $650 are as good as it gets in a Turkish-made (ATA) gun backed by a reputable U.S. company. The Mossberg 930 is always a solid choice, starting at $500 or so with the upgraded Duck Commander Pro Waterfowl version running at about $690. The new Remington V3 has been one of the most impressive new releases this year, selling in camo versions for $750 or a bit less, the basic black version shaving off about $100. The Winchester SX3 3 inch camo guns go for right at $950 or so: it is essentially a re-branded Browning Silver. In the warranty department, all Remington product now has a lifetime warranty. Mossberg has a ten year warranty on their pump actions, two years on their autoloaders, Benelli has a ten year warranty, Franchi has a seven year warranty, and Fabarm USA has a five year warranty. Beretta has a one year warranty, while Browning, “Winchester,” and Weatherby do not have written warranties but stand behind their product. There are some exceptions, such as the inertia Browning A5 that has a “5 year, 100,000 round” guarantee. Many left-handed shooters have shot right-hand eject autoloaders for so long, that left-handed shotguns feel funny. That's up to the individual. If you are interested in a left-handed autoloader, Benelli offers them, Remington has a left-hand Versa Max, and Fabarm USA offers their XLR5 Waterfowler and their L4S Initial Hunter in left-hand versions. Beretta A400 models are also showing up in LH configuration. I'm suggesting what you "might want" because you might be hunting in colder, or warmer conditions than myself or the next fellow, and your version of excellent gun balance and gun fit might be different than mine. Just because a gun doesn't fit me, personally, doesn't mean it is a bad gun . . . it is just a bad gun for me. You might want a safety at the back of the trigger guard, but trigger guards come in different sizes, so it is the ease of reach that is more important that where it is in relationship to the guard, it is the relationship between your forefinger and the cross-bolt safety that matters. How well a shotgun shoulders is important, but not how it shoulders in a gun shop as much how well it shoulders with your hunting gear on. Weight and balance are of course important, but not unloaded weight and balance: loaded weight and balance, for that's how we use them.How smoothly a gun loads and unloads is important as well. Not just how well the controls seem to function in a sterile pro shop, but how well they function with gloves on: the closer to actual field conditions, the better. Having tested multiple examples of most every available autoloader in the United States over the years, historically the Browning Gold-Silver / Winchester SX2 / Maxus models have been the softest shooting. Right now, the Versa Max wins in part due to its substantial weight, but the Remington V3 edges out the Browning gas gun line in the 7 lb. weight class by a small amount. Most gas guns are comfortable to shoot: the Mossberg 930 DC weighs in at 7 lbs. 14 oz. unloaded. While no one's version of a ultra-flyweight, it is a also a soft shooter as a result. With three examples here currently, testing the first starting over 1-1/2 years ago, the Remington V3 is currently the best all-around duck gun for the dollar today as far as I'm concerned. It is a bit softer shooting than even the Maxus, it has a better trigger and factory choke tubes than most autoloaders on the market with the Full choke tube being rated for steel shot use. The trigger face is generously wide, the safety button at the back of the trigger guard is nice and large: it is effortless to get off. With 3 inch shells, the V3 is "in the zone" as four of the eight gas ports are automatically blocked off by the unfolded length of the shell, making it an exceptionally smooth functioning gun with the most popular waterfowling loads in use today. The new Fabarm XLR5 Waterfowler is also worth a mention, due to its exceptional machining and build quality, along with generously chrome-plated internals. Unlike the XLR5 target guns, it has a 3 inch chamber and a true "Pulse Piston" action. It does borrow the "Long Rib" from the XLR5 LR target model, the wide and elevated rib makes for a very comfortable more heads up shooting position. It is almost perfect. For me, the 26 inch barrel model that is in the works will be perfect, while the current offerings of 28 and 30 inch barrels are lengths that others prefer. Despite its traditionally poor Browning autoloading triggers and low-quality factory Invector Plus choke tubes, the Winchester-branded SX3 is still a solid autoloader, now that Browning seems to have its broken-spring Activ valve issues more or less sorted out. It takes a back seat to the Remington V3 which is less costly, but gun fit is an intensely personal choice so it certainly rates a look if you are in the market.